MAUSTON, WIS. – VCSU junior Phillip Almanza fired a five-hit shutout Sunday afternoon and the Valley City State baseball team swept a doubleheader from Viterbo University. Almanza was nearly untouchable in game one of the doubleheader, striking out 12 batters as he pitched a 9-inning complete game in VCSU’s 5-0 win. In game two, Jacob Rosales pitched a 7-inning complete game and struck out 11 batters as the Vikings completed the sweep with an 8-6 victory. Valley City State improves to 11-14 overall and 6-4 in the North Star Athletic Association. Viterbo University drops to 7-21 overall and 2-9 in conference play. 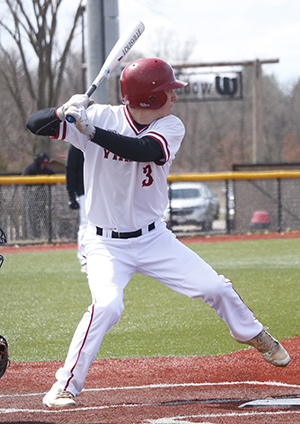 Brady Smith opened the second inning with a solo home run, putting the Vikings on the board first and igniting a four-run inning by the VCSU bats. That’s all the offense Almanza would need on this day. The junior right-hander diced his way through the V-Hawk lineup, scattering just five hits, walking no one and striking out 12 during a 9-inning complete game shutout. With the Vikings leading 4-0, Viterbo put two runners on in both the second and fifth innings. Almanza stepped up to the challenge by inducing a shallow pop out to end the second inning, and then worked out of the fifth inning with back-to-back strikeouts. The V-Hawks also put two runners on the ninth, but Almanza closed the game with a groundout to third base. Almanza’s 12 strikeouts is the most by any North Star Athletic Association pitcher this season, and his shutout is the first of the year for the Vikings. The Vikings finished with 10 hits in the game, including two each by Grant Wehseler, Emmanuel Leyva and Jorun Hamre. Wehseler doubled and drove in two runs, while Smith picked up one RBI with his solo home run. Viterbo’s Noah Bouley had two hits in the game. Samuel Torsey took the loss after allowing seven hits and five runs over seven innings of work. He walked one and struck out seven. Only two of the five runs were earned. Jacob Rosales fired his second straight complete game on the mound and the Vikings overcame four errors as they completed the sweep with an 8-6 win in game two of the doubleheader. Rosales gave up four hits and six runs while striking out 11 batters. The 11 strikeouts is the second-highest individual total in the conference this season, trailing only the 12-strikeout performance by Almanza in game one Sunday. All six runs were unearned due to four Viking errors. Valley City State scored first with two runs in the second inning on a fielder’s choice and a double steal. Viterbo struck back to take the lead with four runs in the third inning, taking advantage of three Viking errors to score four unearned runs. The Viking regained the lead with three runs in the top of the fourth. Jorun Hamre drew a one-out walk to start the rally, and Christian Peery followed with a double to left field. Jayden Shipman‘s RBI single cut the deficit to 4-3, and then Nate Soulis tied the game with a pinch-hit RBI single that scored Peery. Wehseler capped the rally with a single that scored Shipman for a 5-4 Viking lead. VCSU tacked on three needed insurance runs in the top of the seventh. Sal Avila drew a walk and Aiden Brook singled to put two runners on. Brady Smith singled both home to make it 7-4, and then Smith later came in to score on a wild pitch. Viterbo made things interesting in the bottom of the seventh. Noah Bouley drew a two-out walk and then Nolan Glunz reached on an error. DJ Wilson followed with a two-run double to make it 8-6. Rosales hit the next batter to put the tying run at first base, but he buckled down and sealed the victory with his 11th strikeout of the day. VCSU finished with 10 hits, including two each by Brady Smith and Aiden Brook. Smith finished 2-for-4 with two runs and two RBIs. Four other Vikings had a hit and an RBI. Kyle Gilbertson took the loss for Viterbo, giving up eight hits and five runs over six innings on the mound. DJ Wilson led the V-Hawk offense with two hits and three RBIs.